Other than my post about French bread, the one that was freshly baked pressed, I’ve rarely written about the wonders of la cuisine. And I am certainly no authority on the finer points of French food. But here’s the thing: I love to eat. But he left hospitality behind shortly after we married and began a career in IT. As it happened, I ended up doing most of the cooking. Not because of any gender-based stereotypes but simply because I care about eating well. Every single day. My husband can still pull off a fabulous meal with astounding efficiency, and from time to time he’s conscripted for kitchen duty. I also ask his advice about how to cook things – boil or bake, sauté or simmer? But the day-to-day stuff? If he was in charge, we’d end up eating a lot of pizza. So over the years I’ve learned to do a few basics. I’m certainly not one for anything complicated. Forget the finicky or technically complex. As my husband says, I’m a good short-order cook. I do well with eggs, from quiche to omelettes, grilled meat, sauteed vegetables and au gratin casseroles. And like my late mother, who loved to bake, I’m a fair hand with simple cakes and desserts. The kind that don’t necessarily look that impressive but never stay around very long. 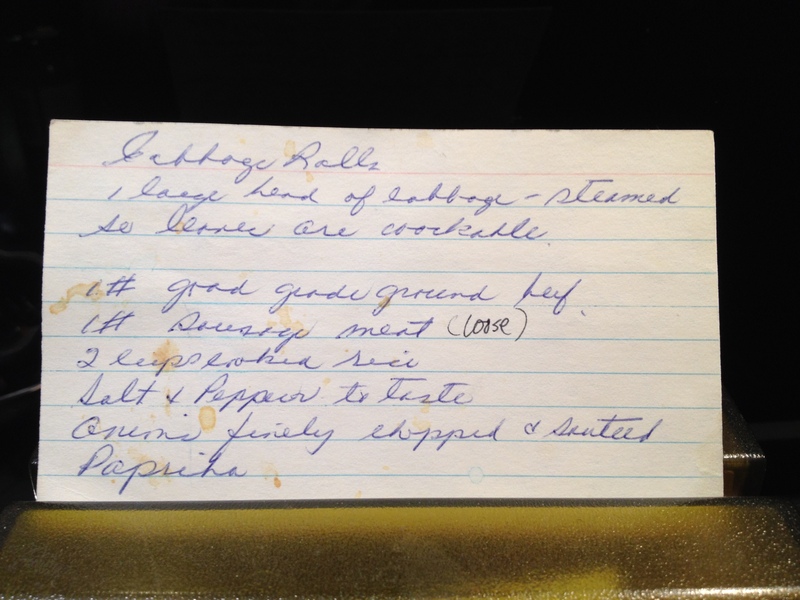 I still have a few of my mom’s recipes, written on index cards in neat, slanting script. Dog-eared, sauce-spattered relics of a bygone era: they are precious souvenirs of her and the love she brought to anything she made. 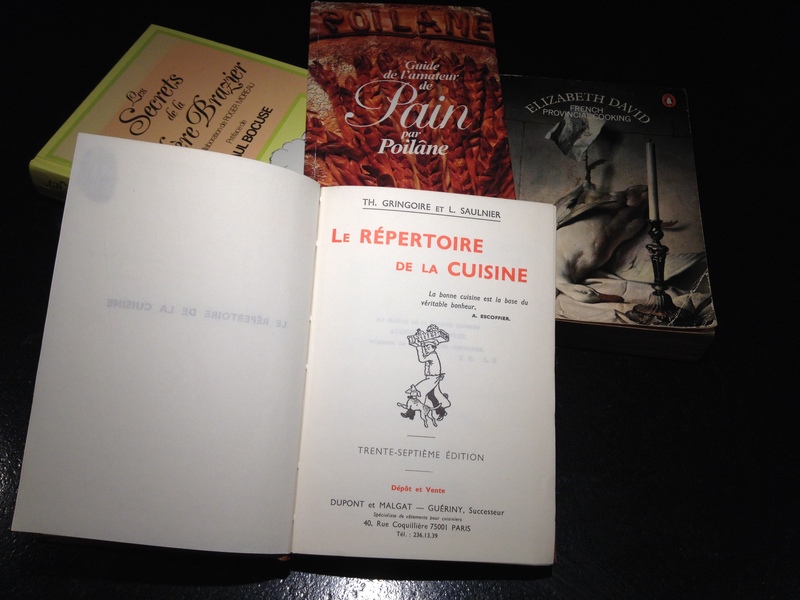 My cookbook collection has expanded over the years to include a few French tomes. There’s the fabulous ‘repertoire de la cuisine’ from my husband’s hotel school days, a primer on the elements of French food. And a little book about bread by master baker Lionel Poilâne (son of the original). There’s the one about la Mère Brazier, queen of the kitchen in the Lyonnaise tradition. And the only book I ever really used for cooking actual dishes, the Elizabeth David book on French provincial cookery that contains one of my favorite recipes, la raie au beurre noire (skate fish in black butter sauce). Now I’ll let you in on a little secret: I do most of my cooking without a recipe. This is something a lot of my North American friends find surprising but seems to be quite common in France. 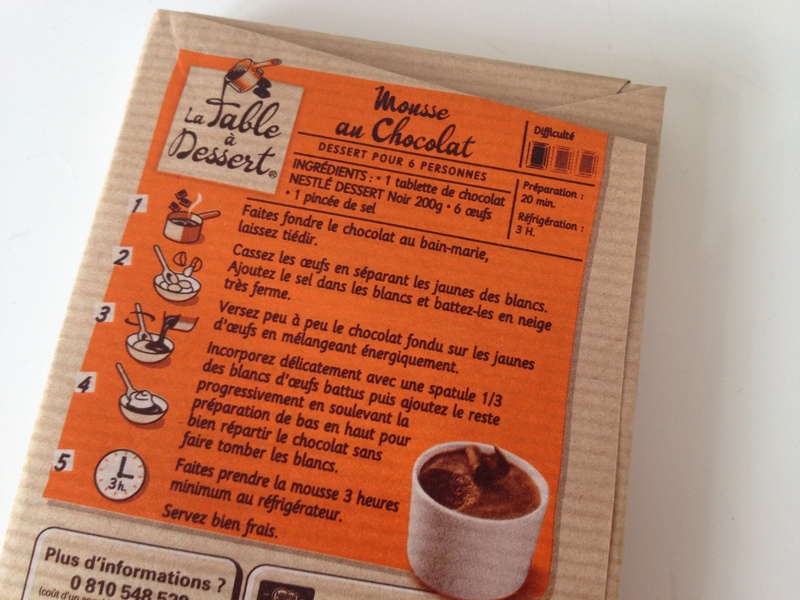 In my experience, the French don’t use recipes all that much, at least not in daily life. In la vie quotidienne, they cook simply and follow a few basic principles: fresh food, in season, home cooked. Or according to old family recipes embedded in their DNA. The fact is, if you’re able to buy good quality ingredients, you don’t need to do anything all that fancy to make them taste good. And if you’re on a budget, it’s all about planning and organization. My version of French cooking – or at least, cooking in France – is not fancy and it’s certainly not rocket science. In fact, you don’t even need a recipe. I’ll share a few of my favorites with you here in upcoming posts. Please feel free to share any of your own!